QUEBEC CITY, Canada—Seated in the front row at the Grand Théâtre de Québec on Tuesday night, May 3, Sandrine Thibout was delighted by the wonderful close-up view she had of Shen Yun Performing Arts presentating classical Chinese dance and music. 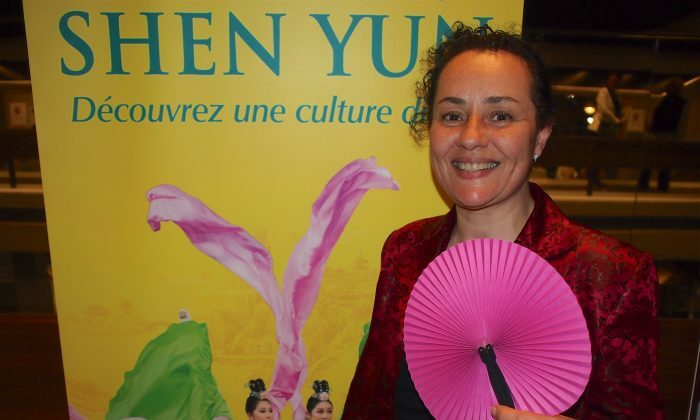 Ms. Thibout, the culture and education specialist at the Charlevois Museum, in the scenic Charlevois region north of Quebec City, shared how the presentation of history and culture at the Shen Yun performance spoke to her. “Colourful, I particularly enjoyed the overview of Chinese history and the cultural and ethnic differences,” Ms. Tibout said, noting that she also appreciated the introduction to each piece provided by the masters of ceremonies. Besides classical Chinese dance, the foundation of Shen Yun performances, there were also folk and ethnic dances from the various regions and ethnicities of the vast land of China. Some of the dances told stories, some were funny, some more weighty, all of them expressive of the spiritual essence of the traditional culture of China. It is a 5,000-year-old heritage rich with noble ideals originating from Buddhism, Confucianism, and Taoism, rich with principles such as benevolence and justice, propriety and wisdom, belief in virtue and faith in the divine. Ms. Thibout said the performance left her feeling uplifted. She explained that her drive down from Charlevoix took an hour and a half, and she wanted to make sure she did not arrive late to see the show, but there was construction work on the road that made the trip sometimes challenging. However, at the theatre enjoying the show, she found it a very moving and calming experience. “I did not feel restless for one minute. I was like a child [watching the performance],” she said. Shen Yun began a decade ago, founded on a mission to revive the traditional Chinese culture, which the ancients believed was transmitted by the divine, but which is nearly lost today following decades of suppression by the communist regime. Ms. Thibout was grateful for that effort. “They have taken on the mission 10 years ago to present the traditions of ancient China, which the communist party in power is crushing in China today. This is important—it’s vital actually—otherwise it would be lost,” she said. That is a sentiment that resonated with Mariana Dagenais, who was also at the performance. A geologist, Ms. Dagenais had family in Ukraine who suffered persecution under the communist dictatorship there. That experience gave her sympathy for the Chinese people who have been persecuted and had their culture and beliefs repressed. “Civilization is what makes the people. It’s in your blood, it’s your roots. If you like your country, if you like your roots, you cannot deny them. They are in you,” she said. Ms. Dagenais said that, beyond the beauty of the dance and music, she was moved by the meaningful ideals conveyed by Shen Yun. For Jean-Francois April, also at the performance on May 3, what stood out was “the grace and the lightness of the female dancers and the strength and energy of the male dancers and their acrobatic feats.” “It was extraordinary,” he said. He was also fascinated by Shen Yun’s unique orchestra. It’s one that combines two of the world’s greatest classical music tradition: Ancient Chinese instruments like the erhu and pipa lead the melody on top of a full orchestra of Western strings, percussion, woodwinds, and brass, as described by the Shen Yun website. “It made for a wonderful fusion cuisine—a gift for the eyes and ears,” Mr. April said. Most of all, “I feel like a better person for having attended this show, and it’s certain that I will return and bring my friends,” he said.